Bella helping herself to what is left of her catnip. This was shot this morning. 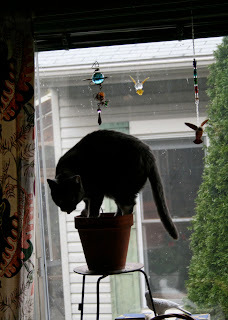 She is very agile and can get up and down without knocking the pot over. 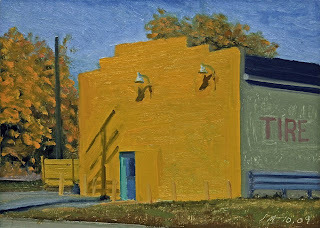 Today's daily painting is a scene with a yellow wall with strong October light and shadows, with the single word TIRE on the side. I liked the play of the teal door against all that electric yellow. 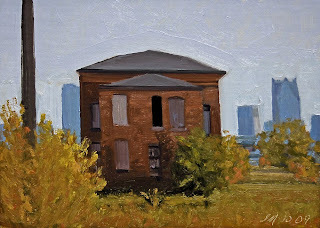 Today's daily painting is a scene of an abandoned Brush Park house with part of the Detroit skyline in the background. 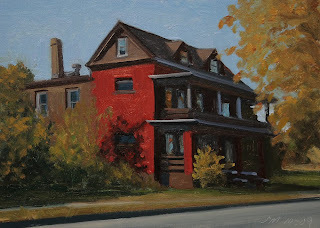 Today's daily painting is a scene of a white house wearing a patina of life . 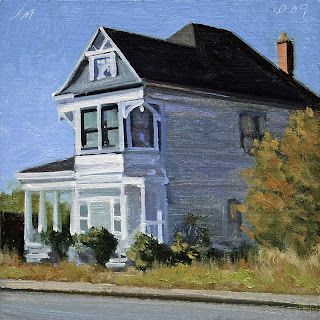 I love the character of these older homes and the stories they could tell. 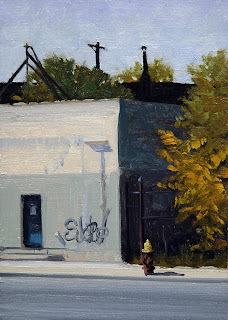 Today's daily painting is a scene on Detroit's Eastside of an abandoned building. 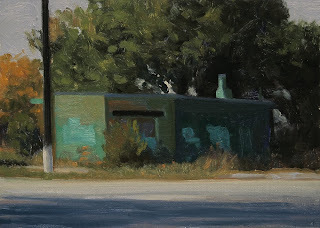 I was really interested in the graffiti tags and warm color and shadow masses created by the strong October light. 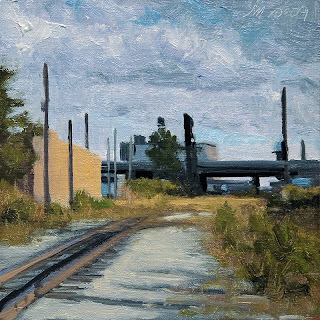 Today's daily painting is of one of the many bridges on Belle Isle in the Detroit River. 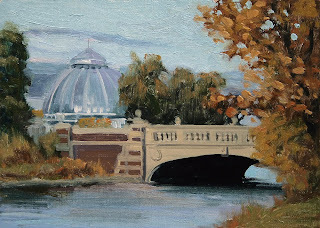 In the background is the beautiful Belle Isle Conservatory. 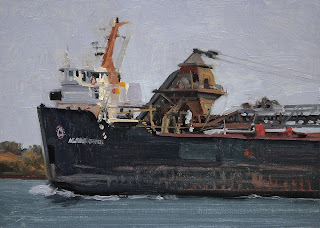 Today's daily painting is of the Agawa Canyon, a Great Lakes self-unloading bulk carrier upbound on the Detroit River. We were on Belle Isle while this wonderful freighter passed by. It is always a treat to see these monsters up close. 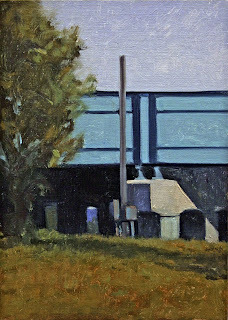 Today's daily painting is of a simple low building. 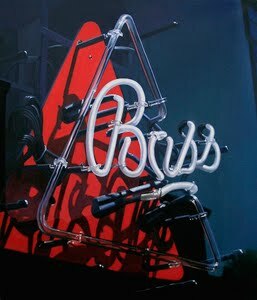 What attracted me to this one was the flat shapes and the strong contrast of light and shadow. I also like the fall color in this one. 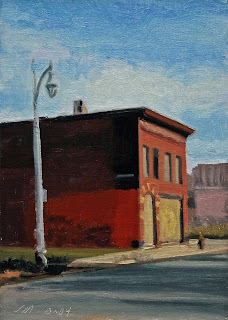 Today's daily painting is a scene on Detroit's Eastside of an abandoned corner building. 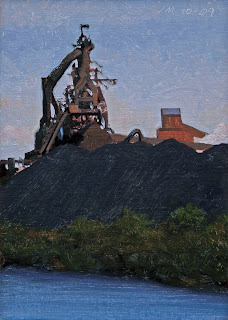 I was really interested in the color and the shadow masses created by the strong October light. 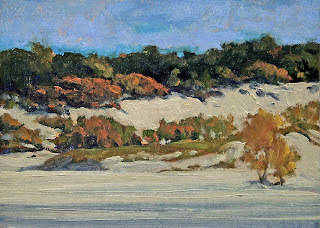 Today's daily painting is a fall scene of the dunes on Lake Michigan, North of Lakeside. 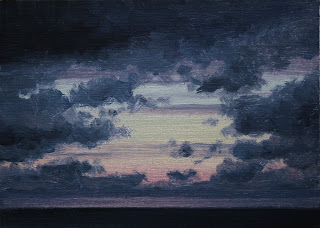 Today's daily painting is of an approaching storm over Lake Michigan at Lakeside.This was last Sunday, today is bright and sunny, a beautiful fall day. 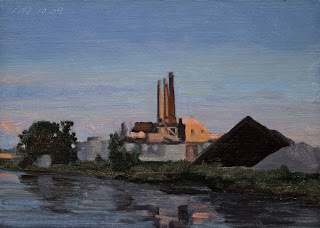 Today's daily painting is a nocturne of the downriver industrial area on the Rouge River. 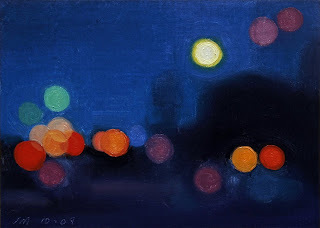 I was drawn to the great contrast of the dark masses against the sunlit areas. 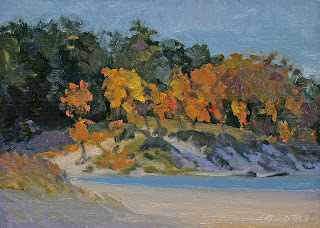 Today's daily painting is a fall scene of the dunes North of Lakeside on Lake Michigan. We took last weekend off and spent it at the Lakeside Inn in Lakeside, MI. It is a wonderful old inn with a duel fireplace and stencils of pine cones and ginko leaves on the ceilings and walls, with lots and lots of history. The dunes are north of Lakeside, I will probably paint more from this trip. 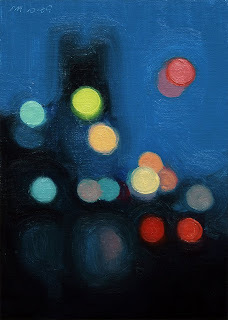 We meet some wonderful artists from Chicago who run the Lillstreet Art Center, an Artist in Residence Program. 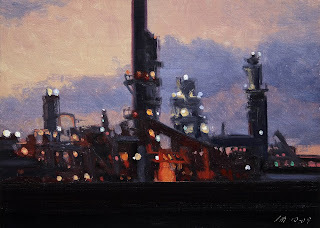 Today's daily painting is a nocturne of the downriver industrial area near the Rouge and I-75. 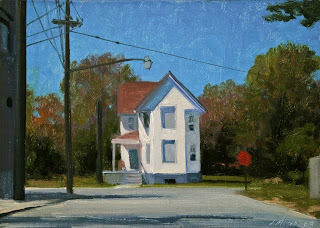 Today's painting is of a white house at the end of the road. A very strange place to put a house, or was the house there first? 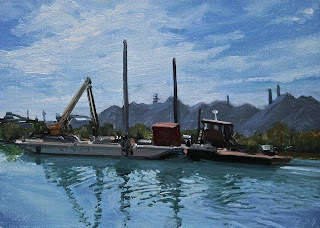 Today's painting is of reflections of a barge and tug at Zug Island. Interesting that water has a way of making a scene come to life. 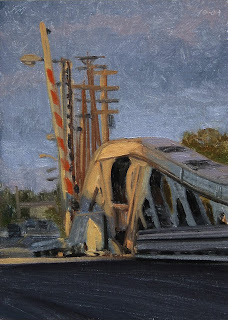 Today's painting is a bridge in the New Center area of Detroit. 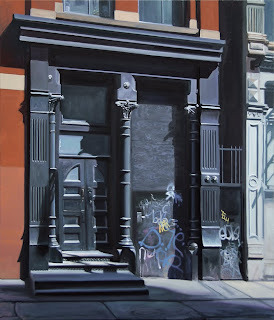 oil on linen, 2009, 42x36"
This painting is available at the George Billis Gallery in Chelsea. 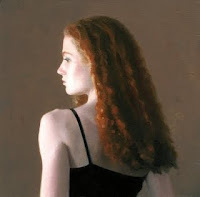 Please contact the Gallery for more information on the large gallery paintings only. 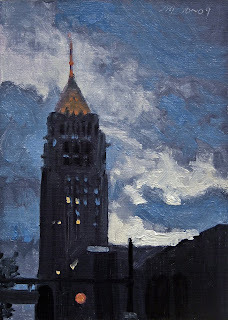 Today's daily painting is a dramatic nocturne of the Fisher Building. A beautiful 1920's era skyscraper. 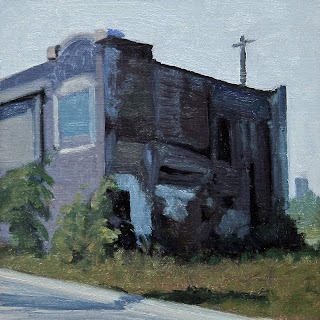 Today's daily painting is of a long abandoned building in Detroit. 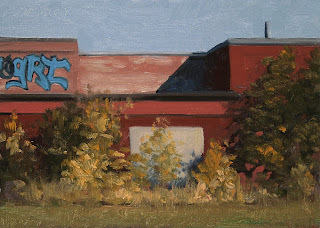 The twenty-eighth painting in the Abandoned, portraits of Detroit series. 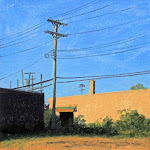 The twenty-seventh painting in the Abandoned, portraits of Detroit series. 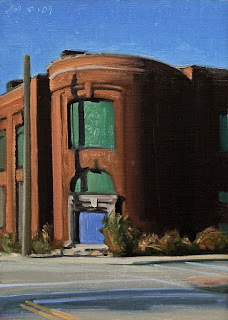 Today's daily painting is of an abandoned corner building. 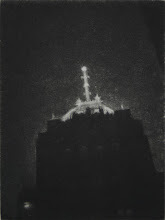 The twenty-sixth painting in the Abandoned, portraits of Detroit series. 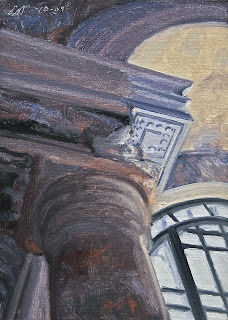 Today's daily painting is a detail of a column inside the abandoned Michigan Central RR Station. 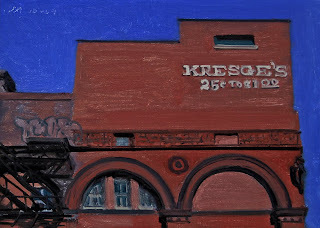 The twenty-fifth painting in the Abandoned, portraits of Detroit series. 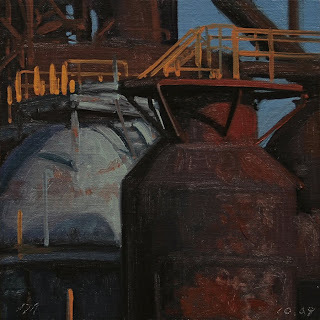 Today's daily painting is a detail of late afternoon sun on the Great Lakes Steel plant on Zug Island. Sure wish I could get on this catwalk to take some shots for paintings. 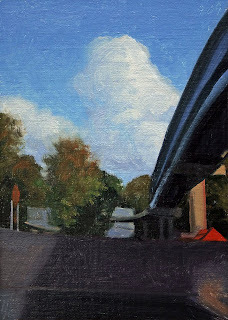 Today's painting is an urban landscape of a scene along I-75 with a bridge in shadow with a splash of color. Unfortunately the splash of color is caution signs waiting to interrupt our drive.